The end users in the global software defined storage market are industries such as the BFSI, telecom, manufacturing, education, media and entertainment, healthcare, high tech, and others such as logistics and warehouses, and e-commerce. Of these, the BFSI industry is expected to account for the leading share in the global market. The sector is expected to continue its dominance in the coming years as the sector is realizing the urgent need for foolproof data back up plans. On the other hand, the healthcare industry has also been identified as one the fast growing segments owing to the increasing expenditure for the development of healthcare sector globally. Analysts expect that BFSI industry will progress at a CAGR of 29.4% in the global market over the forecast period. On the basis of geography, the global software defined storage market is divided into Asia-Pacific, North America, the Middle East and Africa, Europe, and Latin America. Out of all these regions, North America accounted for the dominant market share in 2016 and it is projected to dominate the software defined storage market over the forecast period. This trend will be attributable to the strong presence of software defined storage solution vendors in the regional market. The U.S. is expected to lead the North America software defined storage market due to a higher acceptance of the technology. Asia-Pacific held a considerable market share of the software defined storage market in 2016 and it is likely to have an increasing market share over the forecast period. Adoption of virtualization technologies in this region has eased the expansion of software defined storage market. China held a considerable market share of the software defined storage market in 2016 and it is likely to have a considerable market share over the years to come. Latin America is one of the fast growing regions and it is likely to have a decent market share over the forecast period. Brazil held the maximum market share of the software defined storage in this region over the forecast period. The important players operating in the global software defined storage market are Dell Inc., VMWare, Inc., Dell EMC, Oracle Corporation, Microsoft Corporation, International Business Machines Corporation, Hitachi Data Systems Corporation, Hewlett-Packard Enterprise, NetApp, Inc., and Cisco Systems, Inc. The report covers the analysis and forecast of the software defined storage market on a global and regional level. The study provides historic data of 2016 along with the forecast for the period between 2017 and 2025 based on revenue (US$ Bn). A comprehensive analysis of the market dynamics that is inclusive of market drivers, restraints and opportunities is included in the purview of the report. Additionally, the report includes potential opportunities in the software defined storage market on the global and regional level. Market dynamics are the factors which impact the market growth, thereby helping to understand the ongoing trends of the global market. Therefore, the report provides the forecast of the global market for the period from 2017 to 2025, along with offering an inclusive study of the software defined storage market. 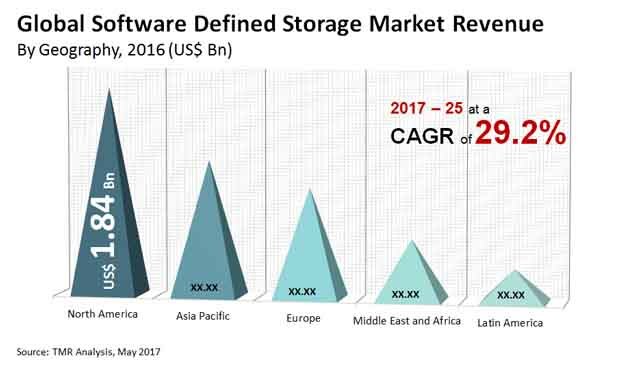 The study provides a comprehensive view of the software defined storage market by segmenting it based on usage, software and end-user. By usage, the software defined storage market has been segregated into data back up and disaster recovery, surveillance, storage provisioning and others. By software, the software defined storage market is segregated by SDS server, SDS controller software, data security, data management and others. On the basis of end-user industries, the software defined storage is segmented into BFSI, telecom, manufacturing, education, media and entertainment, healthcare, high tech and others. Demand for software defined storage has been derived by analyzing the global and regional demand for software defined storage in each end-user industries for its respective functions. The global software defined storage market has been analyzed based on expected demand. Forecasts have been based on the expected demand from software defined storage end-user industries. We have used the bottom-up approach to estimate the global revenue of software defined storage market, split into regions. Based on end-user industries, we have summed up the individual revenues from all the regions to achieve the global revenue for software defined storage. The end-user industries split of the market has been derived using a bottom-up approach for each regional market separately, with the global application segment split being an integration of regional estimates. In the absence of specific data related to the sales of software defined storage of several privately held companies, calculated assumptions have been made in view of the company’s product portfolio and regional presence along with the demand for products in its portfolio. The report provides the size of the software defined storage market in 2016 and the forecast for the next nine years up to 2025. The size of the global software defined storage market is provided in terms of revenue. Market revenue is defined in US$ Bn. The market size and forecast for each application segment are provided in the context of global and regional markets. Numbers provided in this report are derived based on demand generated from different applications. Market dynamics prevalent in North America, Europe and Asia-Pacific have been taken into account for estimating the growth of the global market. The competitive profiling of the key players in the global software defined storage market across five broad geographic regions is included in the study. These include different business strategies adopted by the leading players and their recent developments as in the field of software defined storage. The major players in the software defined storage market are VMWare, Inc., Dell EMC, Oracle Corporation, Microsoft Corporation, International Business Machines Corporation, Dell Inc., NetApp, Inc., Hitachi Data Systems Corporation, Hewlett-Packard Enterprise and Cisco Systems, Inc.